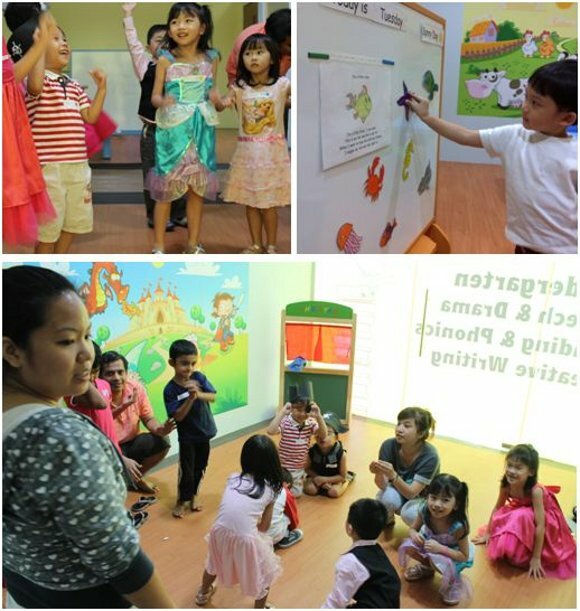 The Language League is the English Language specialist which has two Learning Centres located at Ang Mo Kio and Serangoon which cater to the whole spectrum of Creative Writing, English and Literature classes from Pri 1 – Sec 4, Reading and Phonics, Speech and Drama for preschoolers and Eduparties- educational parties for kids at our colourful venues. It also runs The Little Language League kindergarten. This structured and back-to-basics approach to reading is designed to engage your child with interesting stories while teaching the fundamentals of phonics. Our in-house curriculum, using colourful and engaging stories, is designed to put the fun into reading. This programme is aimed at developing early creative writers. Using a range of carefully selected books and other reading materials, our experienced teachers teach the concept of print and writing strategies for preschoolers against the colourful backdrop of engaging stories and games. It is always worrying for any parent when they discover that their child is struggling to read. This programme is targeted at readers in Primary 1 or 2 who are reading below grade-levels. This supplemental literacy intervention goes back to the fundamentals of reading and lays the building blocks of reading through a revisiting of phonics and vocabulary building. Our Preschool Curriculum Director will assess each student’s reading ability at registration. Our creative speech and drama lessons are structured around dramatic play, story enactment, imagination journeys, theatre games, music and dance. “Let’s pretend” is the norm in our creative classes and our students are encouraged to articulate their ideas and expressions in a stimulating classroom environment. Conducted by professional actors and/or directors, our Speech and Drama classes will bring out confidence in any child while encouraging high levels of spoken English. Our enrichment classes cover all aspects of the English Papers and provide timely remediation for your child week by week. Our creative writing component gives help to students who need extra special idea and vocabulary boosters for the composition and situational writing components of the English paper. From Primary 1-5, students also learn the finer points for writing creatively using the renowned Oxford Reading Tree books and short stories as tools for learning. Our PSLE preparation classes are taught by extremely experienced current or ex-teachers with years of experience preparing students for the national exams. Our preschool programmes are conducted by experienced Early Childhood educators with high levels of written and spoken English. After all, your child needs a good role model of the English Language in order to master reading, writing and communicating. Our primary and secondary teachers are MOE trained English and Literature teachers with years of experience teaching in Singapore schools and who are English or Literature degree holders. We take our teacher screening process very seriously in order to ensure only the most qualified teachers help your child master the English Language.